In October this year, Xiaomi launched Mi Mix 3 smartphone. The phone has several slabs like sliding cameras, two front cameras, non-notch bezzel less displays. 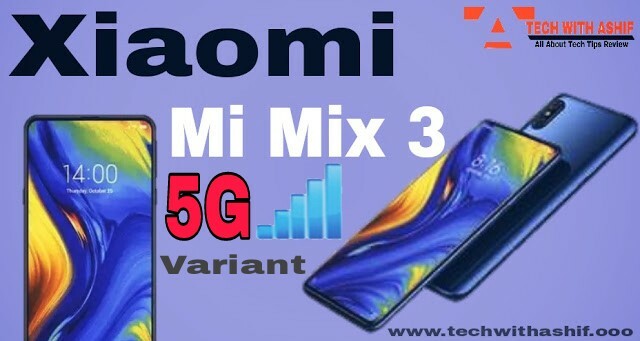 At the launch, Xiaomi had said that next year a 5G update supported variant of the phone will also be introduced. Now Xiaomi's President Lin Bin has shared a photo, in which I have a mix 3 of handsets. This phone is working on the 5G update network. Lin Bin posted photos on China's social media site Weibo. It is believed that the company can soon introduce this variant of the phone. If you look at the photo closely, you will see 5G Update on the top of the network. The Android Pie logo on the left is also visible. It is known that the phone will get the latest update of the Android soon. Apart from the photos, however, none of the information related to Lin Bin's phone has been shared. It is believed that I will get the 5G Update variant specifications of Mix 3 and the same as the second variant of Mix 3, in the case of design. Speaking of the strengths, I have a 6.4 inch Full HD + display in Mix 3 smartphone with an aspect ratio of 1080x2340 pixels. There is a finger print scanner in the back of the phone. The phone has 10 GB RAM and Snapdragon 845 processor. There are a total of 4 cameras in the phone. There are 2 camera front and back dual rear camera setup. Apart from Xiaomi, OnePlus has also confirmed that he will launch the 5G update supported phone next year. Well, Xiaomi has recently launched its latest smartphone Redmi Note 6 Pro in India. Phone is upgraded variant of Redmi Note 5 Pro.